Although they have been slower than their business-to-consumer counterparts to adopt social media strategies, business-to-business marketers are increasingly acknowledging the value of social media. According to research from a leading global consulting firm, nearly two-thirds of B2B marketing executives view social media as extremely important or a very important channel to interact with customers, partners and stakeholders. However, only 7% of the survey group felt that their organization was leveraging social media very heavily. 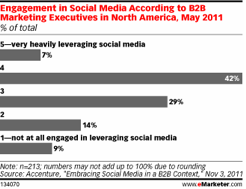 In addition, the survey showed that 9% of B2B marketers were not using social media at all. To that point, a separate study compared social network activity among B2C and B2B brands and found that 12% of B2B marketers neglect social networks entirely, compared to only 2% of B2C marketers. 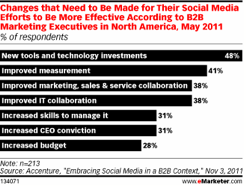 B2B marketers said that technology, tools, metrics and collaboration could be useful to strengthen their social media programs. Nearly half of respondents said new tools and technology would make their social media efforts more effective, and 41% said improved measurement would be helpful. Almost as many B2B marketers said that cross-organizational collaboration would help make their social media programs successful. One of the biggest barriers, though, is knowing where to start. We recommend that B2B marketers begin developing social media strategies by looking at social holistically as a way to build better relationships with consumers. When marketers begin to give social a more defined role in acquiring, developing and retaining customers, the opportunity to leverage social media beyond brand marketing then begins to emerge very quickly.